In this guide, we dive deep into the topic of dolphin intelligence, discussing dolphin behavior and anatomy in attempt to answer the question: how smart are dolphins? Among the many animals in the world, there are few smarter than dolphins. These amazing marine mammals are capable of impressive problem-solving, social interactions, and using what appears to be a complex communication system. In this guide, we dive deep into the topic of dolphin intelligence, discussing dolphin behavior and anatomy in attempt to answer the question: how smart are dolphins. At guide's end, we also provide you with resources and helpful links to our very own dolphin tours here at Vallarta Adventures. Learn more below, and book with us today! Dolphins are capable of complex problem solving and social interaction. They are one of the smartest animals in the world. Research into the behavior of dolphins in the wild and in captivity has yielded incredible data on the intelligence of these marine mammals. Studies show that dolphins not only have the ability to learn as individuals, but those individuals can then pass their new knowledge onto others. These studies include tests with Kelly the dolphin, who was given a test in which she was rewarded with a fish for every piece of litter she brought to researchers. She quickly learned to take single piece of paper, keep it under rock, and tear off smaller pieces to get more fish. Then there was Billie the dolphin, who was trapped in a sealock and rescued. Billie spent three weeks in rehabilitation and was released back into the wild. There, researchers noticed that Billie had started tail-walking, a skill only taught to captive, trained dolphins. Billie had not been trained to tail-walk but had learned the skill simply by observing other dolphins in her rehab center. Billie was also able to teach wild dolphins in her community the skill. Studies also show dolphins in the wild learning to use tools and passing that knowledge down to further generations. One notable example is that adult dolphins will often attach sponges to their snouts to protect themselves while foraging for food. This skill is passed down from mothers to offspring. Current tests for intelligence indicate that dolphins do not possess the same cognitive abilities as humans and are thus not the "smarter" species. Like humans, dolphins possess the ability to beneficially alter their surroundings, solve problems, and form complex social groups. However, dolphins do not display indicators of tool usage, problem solving, and structured discussion to the degree that humans do. Why are dolphins so smart? Dolphins live in complex social groups and have evolved to have highly-developed brains. These factors are the largest contributors to their intelligence. Dolphins have relatively large and complex brains that developed over thousands of generations. Presumably, dolphin brains evolved to meet the needs of their environment. Intelligence and highly-involved social interaction became the means of survival for dolphins, and their brains adapted accordingly. How big is a dolphin brain? Relative to body size, dolphin brains among the largest in the animal kingdom —larger than even those of chimpanzees. Dolphin brains typically weigh about 1600 grams. This makes dolphins second only to humans in brain-to-body weight ratio. However, dolphin brains are quite different from the brains of humans and great apes. Dolphins have much smaller frontal lobes — but they still have an impressive flair for solving problems and a built-in capacity to plan for the future. Unlike primates, dolphins process language and auditory information in the temporal lobes, located on their brain’s flanks. Studies also show that dolphins process auditory and visual information in different parts of the neocortex. Dolphins also have an extremely well-developed and defined paralimbic system, which is responsible for processing emotions. Many scientists hypothesize that dolphins' highly-developed paralimbic systems play a large role in the intimate and complex social and emotional bonds that exist within dolphin communities. Are dolphins the smartest animals? Based on current metrics for intelligence, dolphins are one of the most intelligent animals in the world. While intelligence is difficult to quantify in any organism, many studies suggest that dolphins are second only to us humans in smarts. Using brain size as a barometer, dolphins come in second only to humans in brain-to-body size ratio. However, dolphins also excel intelligence-based tests. Research shows that dolphins mirror self-recognition, cultural learning, comprehension of symbol-based communication systems, and an understanding of abstract concepts — comparable to chimpanzees and other great apes. Want to experience the intelligence and incredible elegance of dolphins up close and personal? Here at Vallarta Adventures, we have the tours for you. On our Dolphin Signature Swim, you get the chance to jump in the water and swim with dolphins at our world-class Dolphin Center in Nuevo Vallarta. 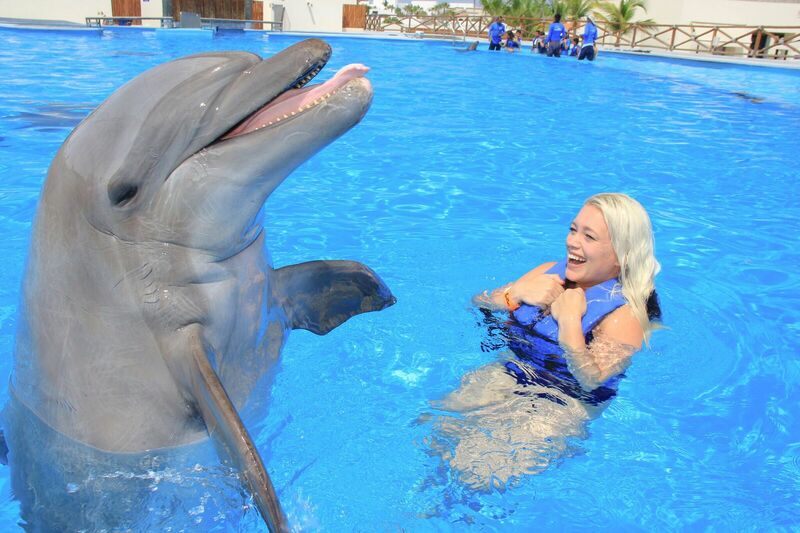 For even more dolphin exposure, we recommend our Dolphin Trainer for a Day experience, where you'll not only get to swim with dolphins — you'll also get learn how to train them and interact with them just like real dolphin trainers! Led by our experienced and knowledgeable trainers, our Dolphin Trainer for a Day experience is a must-book for anyone looking to learn more about dolphins and experience their many wonders firsthand. Want to glimpse dolphins in the wild? We offer many cruises and sailing tours perfect for doing just that. Explore our website to find out more, and book with our team here at Vallarta Adventures today!